Massive strandings of pelagic sargassum have occurred along many coastlines across the Caribbean since 2011. In response to the associated socio-economic impacts and environmental impacts, a variety of mitigation actions have been implemented to cope with this new phenomenon in the region. The observed management responses have generally been reactive, uncoordinated and not always sustainable, which highlighted the need for better coordination and sharing of information and experiences to develop best management practices to deal with this new, and likely reoccurring phenomenon within the region. 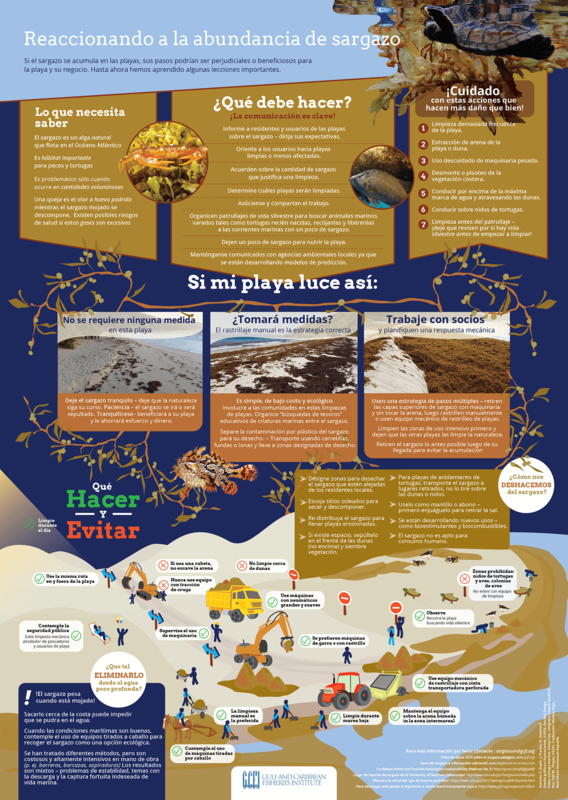 GCFI has published a Fact Sheet about the pelagic sargassum influx in English, Spanish and French. GCFI also co-authored a management brief [hyperlink] about the sargassum influx with key partner CERMES and SPAW-RAC. At each of the 64th, 65th and 67th GCFI meetings, single presentations were made about the sargassum influx. At the 68th GCFI, marked multiple presentations focused on the subject, in diverse sessions and related to differing aspects of research and impact assessment. For the first time at the 69th GCFI there was a special session dedicated to sharing the latest advances in research and management recommendations to address the various impacts and regional needs associated with the sargassum influx. Extended abstracts can be found in the searchable database of proceedings [hyperlink]. In response to the Sargassum influx in the eastern Caribbean in 2018, GCFI commissioned the development of a poster which details how to best respond to this massive influx. The poster is intended for use by the tourism industry including hotels and resorts, coastal zone managers, fisheries ministries, and homeowners. A print version (28mb) and instructions to print the poster are available. Are you sharing this poster with tourism contacts? 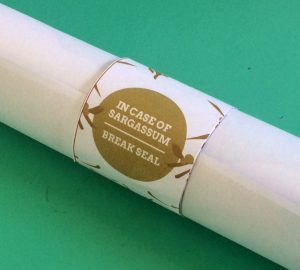 Please add this seal. A digital version (0.6 mb) for ease of sharing electronically is also available. El afiche está disponible en español en versión electrónica para compartir esta aqui y en resolución alta para imprimir aqui. Our colleagues at CERMES have produced an easy-to-read handbook for Caribbean fishers that contains practical tips on how to cope with fishing during times of a sargassum influx. Available in English, there’s a front and back cover page at this link and the full content of the booklet is at this link. Please cite as Speede R.S, S. Cox, H.A. Oxenford. 2019. 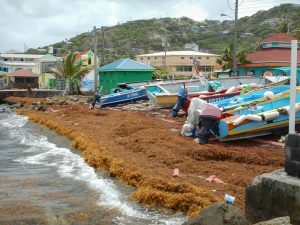 Best Practices for Caribbean Fishers Coping with Sargassum. Centre for Resource Management and Environmental Studies. The University of West Indies, Cave Hill, Barbados. 23pp.